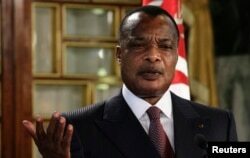 A Congo Republic opposition leader said late on Thursday that forces from leader Denis Sassou Nguesso's presidential guard were surrounding his house, detaining him and three allies opposed to a vote on extending term limits. A referendum on Sunday will determine whether 71-year-old Sassou Nguesso can legally stand for a third consecutive term in next year's election. The president, who has ruled for 31 of the past 36 years, is currently barred from running on account of both his age and constitutional term limits. As in other African countries like Burkina Faso and Burundi where veteran presidents have sought to prolong their grip on power, mass protests broke out in Congo Republic, an oil-rich, former French colony, this week. Four people died when security forces opened fire on protesters, and analysts have warned of further violence. Guy Brice Parfait Kolelas, a former minister who was dismissed for opposing constitutional change in August, said that around 50 soldiers arrived at his Brazzaville home in military jeeps Thursday morning and began patrolling the premises. "The only explanation is that I told the president he is not allowed to change the constitution," Kolelas told Reuters by telephone from his house. "He is trying to control us, to neutralize us," he added. He said three other presidential critics were also present, including Michel Mampouya, leader of opposition party PSVR, and Andre Okombi Salissa, a dissident within the ruling PCT party. Security forces allowed a group of priests meeting with Kolelas to leave the house earlier on Thursday. Confronted about their presence by a bodyguard, the soldiers offered no explanation, Kolelas said. A meeting between government officials, religious leaders and European Union diplomats designed to ease tensions was cancelled on Thursday because of the opponents' absence. On Wednesday, police arrested and briefly detained 18 opposition activists who were attempting to hold a press conference in the Diata neighborhood of the capital. Anti-government protesters also set fire to a market in the Ouenze neighborhood of Brazzaville overnight, they told reporters on Thursday.